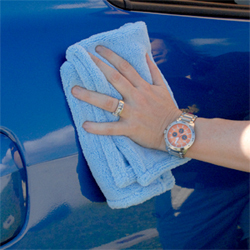 Super Soft Deluxe Blue Microfiber Towels will become your go-to detailing towels for buffing paint to a deep gloss. 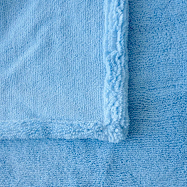 Super Soft Deluxe Microfiber Towels are a luxurious blend of 75/25 microfiber with rolled edges for added protection against scratching. The 16 x 16 inch size and soft weave make the Super Soft Deluxe Microfiber Towels a smart choice for detailing all surfaces. Wash Super Soft Deluxe Microfiber Towels with BLACKFIRE Microfiber Cleaner & Restorer to remove tough residues and maintain the microfiber's softness. Avoid fabric softeners and bleach. Tumble dry on low heat or hang to dry. Effectively this is a one sided microfiber. The rolled edges are not â€œsuper softâ€. Great towel for final light buff after sealer applied. This is my second set of 3. Very soft. did not realize the towels were fluffy on just one side . most towels in that price range are reversible. so they are expensive for what you get . Merchant Response:Hi Darryl, The design is intentional. The "flat weave" side is perfect for removing waxes, polishes, and compounds, while the "fluffy" side is designed to buff off detail sprays and liquid spray waxes. Excellent size and did a great job cleaning and shining car. My truck has a flat black finish and is easily marked.....these Deluxe blue microfiber towels used to finish my surface care make my truck look great........I found no other towel to work at all.